even your personal photos willl need special permission so licences payments will be probably very expensive. It's definitely a worrying thing. I don't think anyone can really predict how this will play out, but it won't be pretty. I know Miscellaneous Stuff means Jazz Jackrabbit off-topic section,but some YouTube users are making gameplays of fanmade Jazz Jackrabbit 2 level packs sometimes it's level maps from Sonic,Commander Keen,Rayman custom level maps.It's uncomfortable some annoying A.I. YouTube algorytm scripts known as bots so it will report to european union.Now you will need Epic Games,Internet Network Providers and European Parliament permissions to upload YouTube videos of some Jazz Jackrabbit 3D fangames including that 2d ones.Next things are links taxes bills to pay and paying some very expensive licences to publish some fanfics and fanarts. Last edited by luke11685; Sep 14, 2018 at 07:57 AM. It seems today YouTube CEO warned me about article 13th of new copyright law.I heard rumors that YouTube might disappear forever. If you'll have polish language in this link just like I have in that case at least you have some videos enclosed in this article.If you wish I can translate into english in case if you could missunderstand my native language. For instance it seems it's working like if someone is uploading YouTube videos and other users will report to YouTube HQ company they are capable to permamently delete somebody's youtube account for good for example siivagunner's video games music meme gags.There are two messages in my native language settings of my youtube channel there are more accurate reasons why his YouTube channel no longer exists.One in polish(I actually translated it)"This account has been closed due to numerous third-party claims of copyright infringement by material posted by the user".However in second it's less precisely explained "This channel does not exist".Who knows this might be just demonstration of how scanning YouTube ID content might look like in future or it could be something far worse than that.It seems Tor Browser will bypass these new copyright regulations. This post will be quite long(I hope it will make lots of sense) it's because I'll be translating few articles for you it make it sound clear.So here comes more precise and more accurate details how tomorrow Google searching results will look like since 12th september 2018 nothing happened however it was just very loud subject in mainstream media I mean innovative political(centre-left)journalism.The law usually comes into force in 14 days from its publication, although its provisions may state otherwise.So even if law will be passed today or tomorrow we have at two weeks to backup at least our YouTube videos before will be deleted or blocked forever. The copyright directive called ACTA 2 is now being finalized. On January 18, the governments of European states will vote on the proposal of the Council of the European Union before the final proposals. In the draft directive called ACTA 2, there are always two extremely dangerous entries. I am talking about articles 11 and 13. The first one assumes that Google, other search engines and Facebook would pay websites for the fact that ... their content appears in the search results or on the platform. This would be done on the basis of giants paying the license. Interestingly, even headlines and very short article descriptions would be subject to fees. However, Google already announces that it most likely only deals with some entities, which will definitely reduce the visibility of other media. In practice, this will reduce access to information. "Currently, Google is open to all content from both large and small publishers. Thanks to this you can get to know different points of view and topics, published by over 80,000 publishers. The version of copyright proposed by the European Parliament would require search engines to obtain a license, which could force providers of these services to choose which materials will be available in the search results and which will not. Most publishers will probably benefit from this, while smaller traffic will be limited, which will make it difficult for small, niche and new publications to find audiences and generate revenue, "Google says. "Let's explain one thing: Article 11 aims to protect journalists and their work, and we agree with this goal. We take care to support the broadly understood information industry, because journalism is of key importance for the functioning of free democracy. We've built Google to provide everyone with equal access to information. However, art. 11 could change this policy and require online services to include trade offers with publishers to display hyperlinks and short message fragments. This means that search engines, news aggregators, applications and platforms would have to introduce commercial licenses and decide which content to include based on these license agreements and which should be omitted, "said Google News Vice President Richard Gingras. 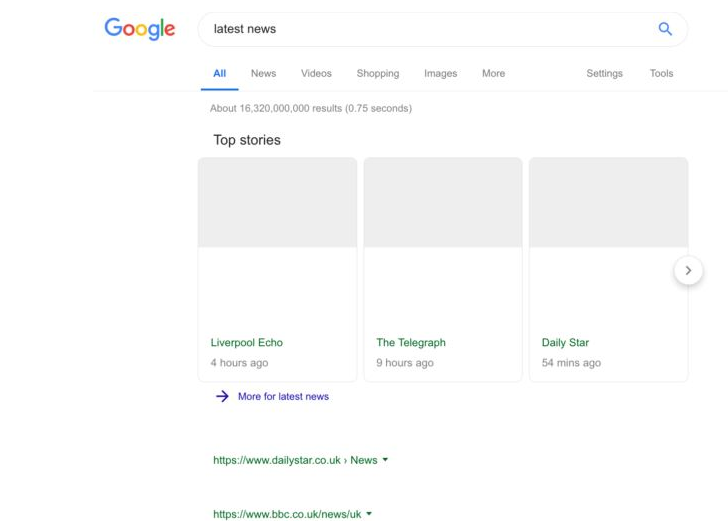 Interestingly, Google has already conducted the first tests on how search results will look after entering into the life of Article 11, assuming that the search engine will not pay publishers (let us remind you that this is exactly what happened in Spain and Germany). In addition to article 11, which will undoubtedly destroy the internet as we know it, article 13 will also come into force. It assumes the introduction by large online platforms of the obligation to filter content in terms of copyright infringement. For this purpose, a special algorithm will probably have to be created, which will check whether the content does not infringe the copyright law before we put something into the network. Opponents of the forced law claim that this will lead to the censorship of the internet and, consequently, to its complete change. The great threat posed by article 13 is evidenced by the fact that MEP of Poland Michael Boni, who had previously supported the entire directive, was against this record. In the whole matter, the fact that the Polish government is silent as if it is anxious is worrying. We contacted both the Ministry of Culture and Digitization via e-mail and wanted to find out what position Poland has in the whole matter. There has been a week since sending the message, and the answers are still missing. January 18 - the governments of countries vote on the proposal of the EU council before the final negotiations. From here, uncertain but probable terms. 25-28 March, 11-14 April, or 15-18 April (not yet confirmed) - FINAL vote in the EP. Good news guys there are no reasons to get worried.As for now I want to tell you how this new copyright law ended up.First of all news my country blocked this new european copyright law.It's banished for good this so called ACTA 2.0. The so-called ACTA 2 has been very loud for a long time. Of course, we are talking about the European Directive on copyright in the digital single market and its controversial articles 11 and 13. However, thanks to internet protests, Poland, Germany, Belgium, the Netherlands, Finland, Slovenia, Italy, Sweden, Croatia, Luxembourg and Portugal have created such called a blocking minority. Thanks to such a turn of events, the voting on the implementation of the directive will not take place and it will not come back as it has been so far (because it is unlikely that we will come back at all). The good news on Twitter was shared by Juliet Reda and Paul Lewandowski. Some time ago, we showed you what search results would look like after the introduction of the directive. Now we are almost certain that the subject of restrictions on freedom in the network will not appear in the current term. In May, elections to the European Parliament await us. Will the new parliamentarians understand that we do not want ACTA 2 or ACTA 3 or any other European-style network? 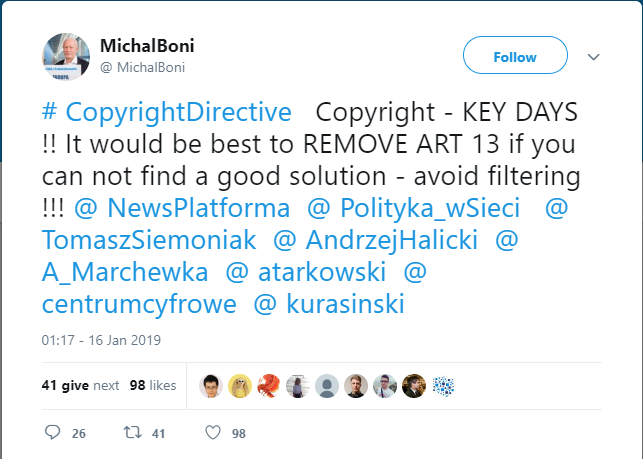 Let's hope.4 days ago according to this article (it's 02:05 am in Poland so it's 23th January)Across Europe, critics of the EU copyright directive have again stepped out onto the streets. In Warsaw, about 50 people expressed their dissatisfaction with the reforms in the European courts.Well I think that's it for today. Small Internet platforms that visit up to 5 million users per month are to be exempt from the requirement to filter content. The first one is to guarantee press publishers related rights, thanks to which they will be able to request from Internet portals publishing fragments of journalistic articles of license fees. The second rule concerns the distribution of profits between creators and intermediaries, especially online platforms enabling their users to post large portions of materials. According to art. 13 the latter would be obliged to conclude licensing agreements with the owners of copyright for the use of their works. Otherwise, they would have to put in place effective mechanisms to detect and counteract violations. In practice, this would mean the implementation of technology for automatic content monitoring. Users whose algorithm would unjustifiably block the material, however, would have a guaranteed path to claim. Governments (including Poland) most unfavorable to the regulations passed in September last year. by the European Parliament believe that they will become a tool for censoring the internet. The exit from the impasse will most probably enable a compromise proposal developed by the government in Berlin with the French delegation. It provides for an exemption from the obligation to actively monitor the content posted therein for websites operating for no longer than three years, showing revenues not exceeding EUR 10 million per year and having a maximum of 5 million unique users. Small portals that meet all these criteria will only have to adhere to the notice and takedown procedure, i.e. to delete copyright infringing material only after receiving the relevant notification in this case. - Even if Poland votes against this proposal, it will not be possible to block the draft directive without the German minority coalition - emphasizes Jack Wojtas from the Chamber of Press Publishers (IWP). Along with the imminent settlement of the EU directive, both sides of the dispute - Internet giants as well as creators and traditional media - have intensified lobbying efforts. After revealing the Franco-German compromise project, the chief attorney and one of Google Kent Walker's bloggers sketched a gloomy picture of the future of the internet on the blog following the introduction of an order in line with the directive. The largest acts are against related rights, arguing that displaying only headers or links in the search results will limit the traffic on publisher sites by as much as 45%. As it appears from Walker's experiment, instead of targeting the pages of press journals, users were more often looking for information, among others via social media. This would confirm the effects that have occurred on a local scale in Germany after introducing there the requirement for Internet companies to pay small fragments of articles. - Even though German publishers after some time conditionally agreed that their content would appear in Google's search results free of charge, their collective management organization - VG Media - went to court, accusing the US company of abusing its dominant position and breaking the law on copyright and related rights - says Wojtas.As you see another long article,but I guess everything now makes sense,right? YouTube changes the copyright protection system. YouTube has often turned out to be a minefield when it comes to copyright. This was extremely burdensome for people who treat the Google platform as the main source of income. Incidents related to the abuse of the system of protection of rights regularly happened even to the most famous YouTubers. 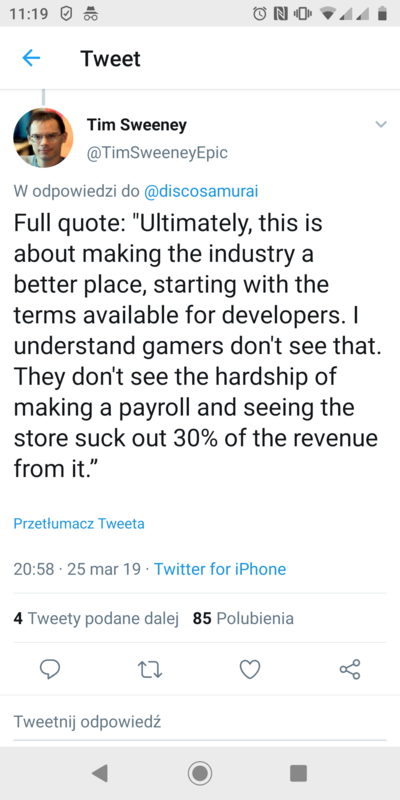 For example, Angry Joe had cases when his own interviews with game developers were "appropriated" by the publishers of these games. The most ludicrous case was to download a fragment of the game from the old Double Dribble game on NES. This material was used in the Family Guy series 7 years after the original user uploaded to YouTube by sw1tched. After broadcasting this episode on television, FOX used a copyright protection system and blocked material that he used without the consent of the other person. Whoever forbids a rich man, is not he? Either way, YouTube has just made changes to the content blocking system associated with copyright infringement. One thing remained unchanged - after receiving three warnings, the account is suspended. Google, however, wants to standardize the system of minor penalties with earlier strikes. Previously, at the first of them, there was a 90-day ban on live broadcasts. After the latest changes, the user's account will be frozen for a week. As a consequence, not only livestreaming will be impossible but any uploading of video materials. If the YouTube system detects another copyright infringement, the next one will be valid for two weeks. After 90 days, the infractions are removed. However, if someone calls for the third time - as before - his account will be deleted. Of course, content marked as infringing on copyright will still be removed from the platform. YouTube has chosen to refresh the copyright policy in response to confused users who, for example, have been affected by the ban on live broadcasts, while copyright infringed other types of content. However, this is not the end of the news - before the strike is awarded, we will receive a minor warning (although the content will also be removed with it). In addition, YouTube is to provide the exact reason for the infraction, and the creators will be referred to the YouTube Guides that discuss this particular case of copyright infringement. Google is also expected to enrich resources related to this topic and offer more information. The changes will apply from February 25. God bless you for fighting the good fight, my man. Well it's just descriptions of how news about this new european copyright laws are spreading across the world. With very little details. Honestly I'm just keep informing you. Anyway now it's time to talk about Wikipedia protests that began yesterday. I heard in Poland that European Parliament﻿﻿ will be working on law changes if it will win votes we can see this law ﻿be ﻿passed in 2021. Yesterday Wikipedia was started protesting. The four versions of the online free Wikipedia encyclopedia - German, Danish, Czech and Slovak - were on Thursday for one day excluded in protest against the planned reform of copyright in the European Union. The dispute is primarily about article 13 of the EU directive on copyright in the digital single market, which is expected to be approved by the European Parliament in the near future. This article decides that all internet platforms - including the smallest ones - are designed to prevent users from infringing on copyright, relating to text or audio materials made available online. This will require "the use of effective content recognition technologies" - which in practice means reaching for the selection software known as upload-filter. In addition, pursuant to art. 13 Internet service providers are to provide copyright owners with "adequate information" on the operation and implementation of these preventive measures. This is accompanied by an instruction to provide "adequate reports" where appropriate regarding the identification of protected materials. There are various exceptions in the enforcement of the directive, it will not apply, inter alia, to Wikipedia. However, the online encyclopedia indicate that the upload-filter is susceptible to defects and hacking attacks, and the need for service providers to obtain a license to publish press texts will seriously limit the freedom of information. The chairman of the Wikimedia Association Czech Republic Vojtiech Dostal believes that the proposed directive will clearly reduce access to sources that are used by authors and editors of the encyclopedia. This will reduce the quality of its passwords. The European Parliament is due to vote on the directive on Tuesday. If it is adopted, Member States will have two years to put it into practice. ACTA2: "We need to think about whether YouTube should exist in Europe"
Axel Voss, the godfather of Articles 11 and 13 of the new EU directive on copyright in the digital single market, which will censor the Internet all over Europe, wonders whether we need YouTube. A German politician and lawyer thinks that Europe does not need the world's largest video service, if it publishes copyrighted and copyrighted content that does not belong to the creators of YouTube. Voss is ready to block YouTube all of Europe right away. On the one hand, publishers are harmed when, for example, the YouTube users use their works without their knowledge and consent, but on the other hand, if it were to ban such activity, the face of the global network that we know and love will change. This will lead to the killing of diversity and the freedom to disseminate content (messages, photos and memes) and to freely share them on social networking sites. Internet users think that they will not protect their rights, but they are an ordinary tax on links, permanent censorship and an attempt to serve Europeans with a new ideology and socialist vision of the world, invented by the EU authorities. It's just a jump on a giant money and the desire for more power over society. The goal is total control of internet media and information flow. If the new law comes into force, most websites, blogs and YouTube channels will disappear. Only rich and influential media will remain and will be strengthened, which are related to the governments of countries and politics. Without any restrictions, they will present in their publications only such messages as they will want and in accordance with their political line and vision of the world. There will be no room for objectivity. The variety of content created by your favorite creators will become a thing of the past. The head of YouTube supports the creation of a new law that will protect publishers, allow them to better control publications and promote their intellectual values ​​on the web, but at the same time opposes the current EU directive on copyright in the EU digital single market and does not want its company and others Internet giants were obliged to permanently restrict freedom, censure speech and block the development of the creativity of users of the global network. On the site, we can read what YouTube proposes in this situation: We want to ask lawmakers to find a more sustainable solution that will allow us to protect against copyright infringement and to creators, performers and users in Europe - express themselves online. To make this possible, we need a system in which platforms and rights owners will participate. - Rights owners should collaborate with platforms to identify content belonging to them. In this way, the platforms will know which materials are protected by copyright, and they will be able to give rights owners the option of blocking them if they decide to do so. - Platforms should only be responsible for content identified by tools such as the Content ID system or as a result of the notification and removal process. - Platforms and right holders should negotiate in good faith when licenses and rights are easily identifiable. Finally, the EP vote on Articles 11 and 13 will take place between 25 and 28 March. Then, after many months of battles conducted by many Internet environments throughout Europe, we will finally find out what the future of the European zone of the global network will look like. If you are interested in the freedom of the Internet and want to express your opposition, you can do it on March 23 in one of hundreds of street protests that will be rolled across Europe, including Poland. The European Union is not isolated in its plans to censor the global network. Similar goals are also pursued by the government of China and Russia (see here). It is worth adding here that politicians from the ruling PiS(Law and Justice) party in Poland are against the introduction of ACTA2 and block its entry into force in the European Parliament. Meanwhile, the Polish opposition, including the most politicians from the Civic Platform, is positive towards Articles 11 and 13. Also special courts for intellectual property will be created. The announcement of this reform, long awaited by lawyers, appeared already in 2016. - The management of the Ministry of Justice has decided to create separate organizational units within the general jurisdiction to deal with matters related to industrial property and related cases of unfair competition - said then undersecretary of state Lucas Piebiak at the meeting of the parliamentary commission for digitization, innovation and modern technologies . A team of experts was set up in the Ministry to analyze the direction of change. Ultimately, it was decided that these specialized courts would deal with both copyright and related rights matters, as well as inventions, utility models, industrial designs, trademarks, geographical indications, topography of integrated circuits. In addition, they will also settle disputes related to unfair competition. - This is excellent news(yeah honestly only for mainstream media)(question is we are representing social-democratic middle class so it could be difficult to afford premium licence budles for spreading multimedia across the world such as fanfictions,fanarts,the right of quoting other forum users,taxes,bills for sharing links it's really cringeworthy financial costs incurring expenses) - Ian Peter Kolczinski, managing partner at the Law Office of the President of the Republic of Poland, R.R.A. He emphasizes that matters relating to copyright and industrial property are not only complicated, but also affect a very special matter. - It would be advisable, therefore, to be recognized by judges who specialize in these areas of law - he notes. As can be read in the description of the project, one of its objectives is to "create judges, within existing court structures, the possibility of specialization in intellectual property and the creation of specialized units in regional and appellate courts". It is also assumed to introduce legal representation by professional representatives. This will contribute to the fact that the proceedings will be faster - both in terms of better concentration of evidence and indicating the legal basis for the requests. The draft will also regulate the proceedings in these cases, in particular the examination of applications for securing evidence, for disclosure and provision of evidence and for request for information. MS assumes that the government will adopt the project in the second quarter of 2019. Thanks to this, it could be passed in this parliamentary term. What will happen with this forum if this law of article 15 and 17 of new copyright law will we have to transfer this forum database to Tor browser (Darknet including deepweb) of onion proxy servers licenced as open source? Google breaks the (is that why since 2016 all wikipedias are still currently marked as so-called fandom?)GDPR. He is to pay 50 million euros in penalties. The French Commission for Network Security (CNIL) has charged Google with a EUR 50 million penalty for breaching the Data Protection Directive. You can not make the activation of an Android device dependent on the creation of an account on Google. This violates the GDPR, "said CNIL in her decision. New Android users must provide their data to take full advantage of Google services. Meanwhile, information about their use is unclear and difficult to access - pointed out the French commission in response to complaints from two non-profit organizations. https://www.youtube.com/watch?v=BLH1x_SGAL4 Does it sounds like propaganda? After World War 2 Poland was affected by USSR. I don't want to behave and pretend to be thinking like populist. Don't you think there's something in common about it speaking of new european copyright law regulations? I'm afraid all Wikipedia articles will be cleaned up and wiped out for good and will be revived if we keep paying licence. https://knowyourmeme.com/memes/donal...ng-bong-speech I guess it was before Bernie Sanders was rejected when he was competing of presidential ellection in USA with Hillary Clinton and Donald Trump(I heard actor Bill Murray told once that he wanted to start his presidential election in 2020 when Animaniacs will be rebooted on Hulu Disney will take over the shares I mean corporate holdings probably 10%)Epic Tencent Games(chinese corporation) in nutshell. https://www.youtube.com/watch?v=rupd8QCvGUQ It annoys me when this lady is pronoucing his surname like Huatang or Huatung not Huateng.Is it even correct pronunciation?By the way does he only thinks that only Battle Royale,online sport and mobile games genres including MMORPG are profitable video games only?I guess he's doing what he wants or else he has no idea how else he can satisfy his chinese consumers.Don't you think Tencent's penguin mascot reminds you of Linux's penguin thanks to his lawyers no one dares to notice that it's like copyright infringement.Chinese electronics they still love bootleg stuff I mean things not only video game consoles and console games.Innovations in China or not they still have cheap workforce. 2.0,Robocopyright,EPICA(European Parliament Internet Censorship Act),Article 11 and 13(I heard rumors that these one were renamed to article 15 and 17(article 17 another gossip I heard it was adopted,passed in 1994 in mid-90's in any case in 2nd February it might change due to fact first copyright law in USA was enacted in 1976) of new copyright law,just Article 11 and 13.In past another copyright laws were regulated. Geneva Convention on Copyright (1952) what a coincidence since then Netherlands joined to membership European Coal and Steel Community before European Union was found(created) in 1992/1993 early 90's. The Act on copyright and related rights adopted in 1994(it affected Poland back then) (and subsequently amended) regulates, among other things, the subject and the subject and the general concept of copyright, exceptions and restrictions on copyright, the duration of copyright and protection of the subject of copyright. As we see here copyrights has been evolved.So I guess it will keep evolving for all eternity.So will european network(internet) and its users suffer something like digital online bailiff.It sounds like nightmare,don't you think? It seems quoting or copy and paste comments will be strictly prohibited and illegal. If in future for instance next year 30% of revenue(for me, jazz2online community creator/founder or Unreal fans, incineration digital CEO, epic games CEO and Tencent CEO) on epic games store for some "fangames" fan service software support (I have no idea if it will happen or not) is too much I can decrease it to 15% maximum if it's not acceptable then let's divide it to 5% of minimum revenue. Deal? Anyway it's also called ACTA 2.0 because former Comcast lawyer and current FCC chairman Ajit Pai(I guess it was profitable for Verizon,Comcast,FCC and Hollywood modern film industry nowadays) repealed Net Neutrality.So the question is will we be lawsuited and forced to pay large money penalties for bypassing European bots algorithm? That's why literally it's the downfall of digital computer piracy. It means no more memes YouTube poops (for instance no ytp about Japanese McDonald's commercials (USA and Japan only) no ytp and meme gags about Gabe Newell (USA and Japan only) to watch Europe region locked speaking of future something beyond our comprehension. It seems for example special licence will have to be purchased to have digital permission for modding/patching Jazz Jackrabbit 3 (I guess premium bundles unity, unreal engine 1 or 4, Godot game engine,blitz game engine,DirectX sdk...etc.For instance just like on Netflix.https://www.jazz2online.com/jcf/showthread.php?t=19325 alpha demo no more unofficially distributed.I'm afraid this website will be blank https://www.jazz2online.com/j3f/ perhaps this website will be blank first anyway so administrators and moderators will need and have to pay probably very expensive licence and keep waiting for licence permission agreement perhaps this website will be quite blank like document text files from Microsoft Word.This means creators of this website related to cancelled sequel of Jazz Jackrabbit 2 we'll be dealing with A.I. bot algorithm,European Parliament,Epic Games,Tencent. That's what I noticed today. Polexit began on Monday 25 March. The judgement of the Constitutional Tribunal regarding the neo-KRS is the first formal step towards the exit of Poland from the European Union. Wojciech Sadurski, professor of law faculty at the University of Sydney and the European Center of the University of Warsaw, is currently a guest professor at the law faculty of Fordham University in New York. The so-called. the ruling of the Constitutional Tribunal regarding the National Council of the Judiciary is a decision on coffee and cookies - it has no legal force, as it was taken with the participation of an unauthorized person, in addition to being the rapporteur (Justin Piskorski). Without offending the drivers in any way (as opposed to doubters are honest people), the driver could also be a member of the Przylebski(magister-mgr) team. And on this you could close the discussion about this so-called judgment. There is only one rescue board, the so-called Netherexit, as the UK did, apparently, the chairman of the polytech(political party) UKIP, Nigel Farage (such British counterpart of the Hungarian Victor Orban) dipped his fingers.Or else we will have to be prepared for keep suffering unforeseen consequences. Belgium,France,Netherlands,Luxembourg,Germany,Ital y,Denmark,Ireland,just like UK did,Greece,Spain,Portugal,Austria,Finland,Sweden,C zech Republic,Cyprus,Estonia,Lithuania,Latvia,Malta,Pol and,Slovakia,Slovenia,Hungary,Bulgaria,Romania,Cro atia. http://chng.it/XM7SMXHNQv Sign a petition today before it's not too late. I heard Soulja Boy(afro-american rapper) was so many times lawsuited for his retro video game consoles bootleg hardware in USA. We have a great message on ACTA 2. We can be quiet about memes. The opponents of ACTA 2 took on one issue in particular - the blockade of self-created content, including humorous pictures and memes. We already know that memes will remain. This is explained by attorney Milena Waloszek from Lawmore Law Firm. "ACTA 2" becomes a fact. On Tuesday, the European Parliament adopted new rules. The directive indicates to Member States, among others how to act on copyright issues on the internet. Now on the side of the countries is implementing legislation at home. And what does "ACTA 2" mean for Internet users? In recent months, they have protested throughout Europe. On the banners they carried the password about the censorship of the network or the sad end of the memes. We asked for an explanation from Miley Waloszek from Lawmore. Jacob Wator, WP Tech: What will affect the ordinary Internet user in the case of "ACTA2"? Miley Waloszek: The most significant emotions were caused by the article 13. of the Directive. It can have the greatest impact on people who are users of online platforms and on platform owners themselves. So what will happen to my Facebook? Article 13. introduces the obligation to filter content on online platforms in terms of their compliance with copyright. Facebook-type platforms will have the right to remove content provided by the user if there is a fear that such content may violate copyrights. Exactly. After all, solutions that allow for the removal of a specific content, if copyright is infringed, are already used. What is related to the fact that by accepting the platform's regulations, we commit ourselves that we will not provide unlawful content that violates the rights of other entities. The change itself is certainly not completely revolutionary. But so far, Facebook has filtered content for compliance with its regulations, not EU law. So it will do a bit of work. The controversy that has arisen in connection with the Directive is that filtering of such content will take place automatically. For example, by using appropriate algorithms. So there is a big risk of mistakes? There may be a situation where the platform will remove such content to a wider extent than may be justified. The algorithm can not detect when there is a case of a song parody (eg a song) or a legitimate collage. I think we come to the memes that Internet users are so nervous about? That will certainly make the majority of the population happy. Well, the scope of the Directive will not block the possibility of making the works available for criticizing or parodying, therefore it will not cover songs such as memes. The Directive will also not affect the placement of content on educational platforms - such as Wikipedia - or Git-hub platforms. I have the impression that we are dealing with a storm in a glass of water. Generally, the directive itself does not really introduce new rights. What is legal will remain so and vice versa. The goal is to make it easier for lawmakers to enforce their rights. Introduction of platform responsibility for user content imposes on the platform signing of a license agreement with the owner of rights to content subject to copyright and copyright protection. At present, no person is entitled to any remuneration due to the fact that his content will be made available on a given platform. So it's a big change for the creators. Where are all these protests, demonstrations and panic from? Extending the responsibility of online platforms can lead to an absurd situation where the platform as part of preventive activities will unjustly block user materials, just to avoid possible liability. Hence, one can get the impression that the society shared in the "ACTA2" case in a way where artists and creators are on the side of the supporters of the Directive, and on the side of opponents, those operating in the media and new technologies. I heard that in 2020 in Poland, Donald Tusk will run for the presidency of the Republic of Poland. Then, the legal provisions regarding new copyright laws may become more acute in this matter. The European Parliament has adopted the Copyright Directive on the Digital Single Market, known as ACTA2. It was the final vote. According to critics of this solution, the idea will introduce censorship on the Internet. 348 MEPs were in favor of the directive, 274 voted against. Large internet platforms should no longer be able to earn money on content created by journalists and artists without their fair remuneration. These new copyright laws are specifically tailored to the realities of the digital age and relate to platforms such as YouTube, Facebook and Google News. "We have a really good deal," said MEP Axel Voss, who was negotiating on behalf of the Parliament, a German member from the EPP group who described it as a "good and balanced compromise", but said that issues such as platform responsibilities might require further work in the future. MEPs adopted a project that was pushed by German MEP Axel Voss. Internet platforms and applications in which users can publish content must "make every effort" to obtain licenses for everything that users can upload - that is, all copyrighted works in the world. If the court finds that the platform's efforts to filter content and acquire licenses are insufficient, the platform will be directly responsible for the infringement of users' copyright. The greatest controversy arises from article 13, which assumes the introduction by large online platforms of the obligation to filter content in terms of copyright infringement. For this purpose, a special algorithm will probably have to be created, which will check whether the content does not infringe the copyright law before we put something into the network. Opponents of the forced law claim that this will lead to the censorship of the internet and, consequently, to its complete change. Natalie Mileszik from Digital Centre points out equally disturbing - article 11, which in her opinion may lead to information paralysis. This is confirmed by Google in its official communication. "The latest version of the directive harms small and growing publishers and limits consumers' access to a variety of news sources. According to the directive, showing something beyond ordinary facts, hyperlinks and "single words and very short fragments" will be limited (therefore, the functioning of Google News - ed.). This narrow approach will create uncertainty and may again lead to online platforms limiting the amount of information of press publishers that show consumers. Limiting the length of fragments makes it harder for consumers to discover the content of messages and will reduce overall traffic to news publishers, which is shown in one of our recent search experiments. " In this experiment, Google adapted the links and information to the law that would apply after the implementation of the directive. Then the traffic on the publishers' websites dropped by half, because the information simply was visible poorly or not at all for users. The Ministry of Culture and National Heritage emphasized in the official communiqué that Poland's objection was raised by two articles of the ACTA2 draft directive. "It's about art. 13, which introduces the obligation to filter content in terms of copyrights, and art. 11, regarding the so-called related rights for press publishers. The position of the Polish government is unambiguous from the beginning. Copyrights should be protected, but not at the expense of freedom on the Internet. Poland also opposes overly restrictive restriction of content sharing. Such a solution puts international publishing companies in a privileged position and may act to the detriment of small and medium-sized publishers, including many Polish publishers. " 7 facts about ACTA 2. Will memes really disappear from the internet? - Preventive censorship and the disappearance of internet memes await us - scare opponents. - It's a blow to content thieves - explain supporters. Who's right? We explain what ACTA 2 is really about. ACTA 2 is a colloquial term for the Copyright Directive in the Digital Single Market, namely Articles 11 (currently 15) and 13 (currently 17). Its aim is to reform copyright laws and adapt them to the realities of the second decade of the 21st century. Ambiguous provisions and a wide field for their interpretation arouse a lot of controversy and concern - it is not known exactly what and how it will change after the adoption of the new directive. Who will the new regulations apply to? The new rules will not apply to everyone. They will not include websites offering content on open licenses (such as Wikipedia or GitHub), as well as those that exist for less than 3 years, have less than 5 million views per month (yearly average) and less than 10 million euro turnover. What specific rules will change with ACTA 2? It is not known. The provisions of the directive - although they are controversial and subject to heated debate - are quite general. In practice, everything depends on the details of local law adopted at the level of the European Union member states. If ACTA 2 is adopted, then specific changes in regulations and how the law will change will depend on the Polish parliament. What is the "link tax"? One of the provisions of article 11/15 indicates the necessity for aggregators to share content (such as Google search engine) with the creators of this content. It is about the fact that in a search engine a link to the page to which the link leads appears with the link. According to the proponents of the new regulation, Google earns a portion of someone else's content, so it should share the profits with their author. According to the opponents of this solution, it will lead to the fact that links to some of the websites simply disappear from the search engine. Where do the fears about censorship come from? They result from the provisions concerning art. 13/17. It forces on websites to introduce mechanisms that allow content filtering. Theoretically, this is to catch copyright violations. Concerns concern the fact that the same mechanism can be used to filter content by any key, e.g. political messages. Why are new regulations beneficial for large websites? This is due to the fact that large companies have long used mechanisms that allow filtering content and recognizing copyright violations. Introducing new regulations may mean that nothing will change for large entities. The new costs will apply to smaller ones that will have to implement filtering algorithms, eg by buying a license from someone who has already developed and used such a solution. Will memes disappear from the internet? The issue of internet memes raised in the debate, although entirely on the side, has grown into a fundamental problem in many discussions. Meanwhile - from the point of view of current regulations - the vast majority of memes and today breaks the law, using other people's work without giving the author and source. As a rule, no one is pursuing their creators, and there is no indication that this will change after the adoption of ACTA 2. The issue of memes in no way refers to the merits of the case - it was raised as an emotional argument by the opponents of the new regulations. Landscape after ACTA 2. What awaits us after the adoption of the amendment? The debate on ACTA 2 did not bring a solution. Both proponents and opponents of the amendment presented meaningful arguments. Effect? The Act on the "Digital Single Market Directive" went through only a few votes. What awaits us after the change of regulations? The fight for money - the clash of two business models - was in the case of ACTA 2 embroidered in the robes of a noble fight for freedom of speech. I will venture to say that in practice the dispute over the "Digital Single Market Directive" (that is the full name) amounts to a conflict of interest between content producers and those who live from their recycling and aggregation. Hence, such anxiety of websites such as Polish Wykop, which without the possibility of free use of other people's content are losing their reason. The principle here is simple - a website creating its own content can exist independently. The aggregator, which has nothing to aggregate - either disappears or ceases to be a practical tool. Legal streaming and pirated content. The devil, as usual, is in the details. While the attempt to regulate the aggregation of content, called sneakily "link tax", I can not only understand, but - if it is sensibly implemented - also support, other provisions of the directive raise concern. The greatest concern concerns the algorithms responsible for content filtering. Big websites, like YouTube, have been using them for a long time. The smaller ones are based on the "notice and takedown" mechanism, which assumes that after reporting the violation, specific content is removed by the service provider from its resources. Sometimes, however, this rule is abused, which is a good example of various online websites operating in Poland. Under the guise of legal streaming, they benefit from pirate (with all the ambiguity of the word) content, explaining that they are removing the reported ones. Where does filtration end and censorship begins? Replacing "notice and takedown" with preventive content filtering, however, seems to be a risky activity. While you can understand them in the case of copyright, it's easy to imagine a scenario where the same mechanisms are used to block content that has nothing to do with copyright. They have a lot in common with freedom of speech or views, which are considered undesirable by current legislators. In practice, "filtering" can mean something that everyone would rather avoid, or preventive censorship. Scenarios, drawn in the event of an amendment, are very different. It all depends on who creates it - the "predictions" of supporters and opponents of changing the law are different. Where do quotes come from when predictions? This is due to the fact that the forecasts resemble rather the divination of grounds, rather than the actual analysis of possible consequences. The reason is simple - the Directive on copyright in the digital single market, known as ACTA 2 - is a regulation with very general records. Some of them, even in their general form, may arouse controversy and raise objections. In practice, it will be fair to say that we know that we know nothing. This is because general records have to be translated into a specific language of the laws of the Member States that can do it their own way. The debate on the shape, real scope and impact of new regulations will take place not so much in Brussels as in Warsaw. Tusk on the petition: 6 million people who do not want Brexit can not be betrayed. The head of the European Council, Donald Tusk, declared today during the debate in the European Parliament that in talks about Brexit you can not forget about the votes of those who want to stay in Britain in the EU, and there are more and more of them. Tusk reminded that before the summit he stressed that the EU should be ready to extend Brexit for a longer period if the United Kingdom wants to rethink its strategy. "Which, of course, would mean the United Kingdom's participation in the European Parliament elections," he pointed out. He added that there are voices that such a decision would harm some. "This thinking is unacceptable." Six million people who signed a petition on the withdrawal of article 50 on exit from the EU, a million people who marched on behalf of a civil vote or an increasing number of people wanting to stay in the EU can not be betrayed They may get the impression that they are not sufficiently represented in the United Kingdom's parliament, but they must have the impression that their interests are represented here in this chamber because they are Europeans, "Tusk stressed. Yesterday, the British government rejected a petition signed by 5.8 million people calling for a unilateral withdrawal from the EU exit process, stressing that it intends to 'honor the 2016 referendum result' and lead to the UK leaving the Community. The petition collected a record number of votes in just a few days. She also received support from many pro-European politicians and famous people who took part in the Saturday, estimated at several hundred thousand people, the march of Brexit opponents in London. Article 11 and Article 13 voted - what will happen to the memes? On March 26, the MEPs voted in favor of the directive on copyright in the digital single market. Huge controversies arise from the articles 11 and 13 contained in it, causing fears that after the new regulations will be implemented, we will not be able to create and share memes. Is this true? Around this directive, which is unjustly called "ACTA 2", many myths and false information circulate on the Internet. Some of them are very popular among users of the meme network. In the materials of opponents of the new rules, you can often read or hear that articles 11 and 13, or rather 17, because the last amendments to the directive have caused that he changed the number, will infect internet users creating memes. This argument is quoted quite often because it simply shows Internet users how bad the new rules are. However, this is not true. Briefly, article 11 forces you to have a license for materials that are published, in whole or in part, outside of their source. Article 13 vel 17 imposes on web administrators the obligation to filter content (even those published by Internet users) in view of the breach of the aforementioned license. In the case of memes, which by definition use copyright material to a certain extent, it may seem that the opponents of the copyright directive in the digital single market may be true. However, it is not. In an online debate, you forget about an important thing. The new regulations apply to commercial entities, that is companies that simply make money on sharing information and materials. Therefore, Article 11 will not apply to ordinary Internet users who will still be able to create and share memes, that is, mocking, caricature materials on the current rules, unless they receive material benefits from it. So introducing new regulations will not change anything in this matter. Bigger concerns can be related to article 13 vel 17 and the need to filter content. Website administrators can prevent such content from being prevented, for fear of copyright infringement, which would result in penalties or other forms of liability being imposed on them. Here the matter is a bit more complicated, because currently we do not know how specific the provisions related to article 13 vel will look like. Why? In contrast to the Regulation, which was the GDP of the previous year, EU Member States do not apply the provisions of the EU Directives directly, only on the basis of which they develop their own regulations. How they will look in individual countries, we will find out only when they will be implemented. So how do websites and platforms differentiate between what infringes copyright and what does not? The Directive does not impose specific requirements on administrators, it only indicates that they must take all necessary measures which they consider to be appropriate and proportionate to verify the license. In the case of memes the task is quite simple, because they are quite characteristic and depending on the size of the website and traffic on it, moderators will be able to quickly capture the meme and leave it on the site. In the case of large platforms, where the traffic is large, you can successfully use artificial intelligence and machine learning algorithms. Today such solutions are used on a large scale in services such as Google Photos and even in smartphone software. AI performs well in such tasks, and learning to recognize memes that are quite characteristic will be relatively simple. Voting on ACTA 2 can be repeated? This may not be the end of the history of the directive on the protection of copyright in the digital single market - a Polish MEP speaks about the possibility of reassuming voting or ... adopting a new law that will replace the provisions adopted by the European Parliament. No European law has raised as much controversy as the directive to protect creators from unauthorized use of their works on the Internet. Many debates were held over the wording of the regulations, in which one could often hear the accusation that the proposed provisions could seriously limit the freedom of expression on the Internet. 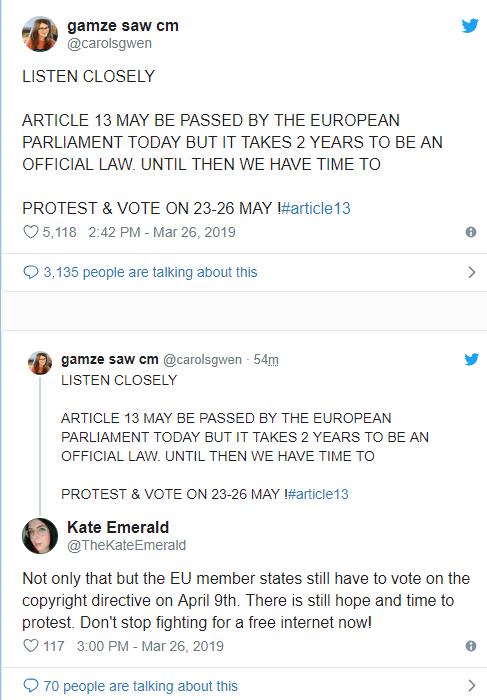 In particular articles 11 and 13 raised doubts, which were intended to prevent the use of fragments of other people's works (eg articles on the internet) to create their own websites. In practice, this could rely on the need to obtain a license even for the inclusion of a link, which would make the functioning of content aggregates and search engines difficult. Google actively participated in the discussion, showing how the giant will see results after the introduction of ACTA 2 regulations. Article 13, in turn, determines the responsibility of the website owners for the storage of content, including those posted by users, in the event of copyright infringement. Due to potential multimillion penalties, it can be expected that the portals will introduce "preventive censorship" and before they allow, for example, a commentary under the text to be shown, first check whether they are not fragments of existing works. The work on the regulations lasted for years - ultimately, however, a version was adopted for the vote, in which there were considered articles controversial. The European Parliament has adopted the directive - perhaps this is not the end of legislative events related to the protection of copyrights. There were voices that the directive could be contrary to the Polish Constitution, which forbade direct preventive censorship. The law that has been passed by the European Parliament requires the creation of implementing rules in each member state. The unwritten rule says that Community legislation should take precedence over local law and in the event of conflict, the laws of a Member State should be changed, but it is difficult to expect, if necessary, public consent to amend the Basic Law in such a way as to be able to accept ACTA 2 The more so because the ruling Polish PIS presents itself as an opponent of the directive. ACTA 2 - is it possible to repeat the vote? MEPs voted in favor of the new rules, while representatives of the PO were divided - some of them were in favor of the law, and some were "no." Karol Karski, PiS MEP, said in an interview for TVP Info that ACTA 2 could still be returned to the European Parliament for consideration. At this point, you can either try to reassume the vote that took place in the European Parliament, or simply choose the right representatives to the European Parliament, who after this year, already in the new parliamentary term, will change these laws and restore freedom of speech on the internet. As you can see, politicians are trying to get votes of people dissatisfied with the ACTA - whether the word about the possibility of passing a new version of the law is sincere, or maybe it is just tempting before the election, will probably show time. Reasumption is a reconsideration of the case resulting in the repeal of the previously chosen decision. The request for its implementation was reportedly filed by Czech Republic MEP Tomas Zdechovsky. The celebrities, politicians,lobbyists and corporations love money(even addicted) they are still living in their own realm of Scrooge McDuck. https://www.youtube.com/watch?v=zQrdKtPJxI0 Adult Swim sense of humor. I hope European bots won't consider this article as antisemitic https://en.wikipedia.org/wiki/Jews I don't want to offend are insult anyone here. They are very smart and intelligent people one more thing I'm not radical, extremist (not fanatic) neo nazi (definitely not) I'm tolerant guy. Thanks to them geopolitics keep evolving no matter if someone like it or not. That's not even any sort of subliminal hidden propaganda. I'm not paranoid. I love political correctness. I hope it wasn't controversial nostalgia. It's just my random thoughts. I will miss times when cartoons had child friendly imagery reinidition of dirty and racial carricatural with exaggerated accents jokes back then they were funny before adult swim came out nowadays they might be considered racist and offensive so in that case politically incorrect because YouTube Kids TV(because it's so dank and retarded just like Rick and Morty)should be only for mature audience because due to only distrubing fetishes with gruesome pseudo sense of humor. Well that's why kids for instance shouldn't play Conker's Bad Fur Day or keep watching Fritz the Cat cartoons. I'm not hipocrite I like Rick and Morty. Democratic Unionist Party against the government brexit deal. The Democratic Unionist Party against the government ws agreement. Brexitu. The Northern Democratic Unionist Party (DUP) on Wednesday maintained the position that it would not support the government's draft agreement exit from the European Union, putting into question the possibility of ratifying it by the House of Commons. In a statement to the media the party stressed that the government Theresa May, failed to obtain the "necessary changes" and there is still a "strategic risk that Northern Ireland would be at the end of the Implementation still closed in the so-called. Backstopie (mechanism of emergency in the absence of a commercial agreement - PAP ) "which" would have potential to generate internal borders within the context of the United Kingdom and cut us from our primary internal market, the UK. " We want to protect the output (...) and our future relationship with the European Union on terms that are consistent with our major objectives and ensure the integrity of the United Kingdom - provided. However, as noted, "the current agreement does not guarantee this, and the so-called backstop is an unacceptable threat." The refusal to support the agreement by the Northern Irish group calls into question the possibility of voting by the House of Commons. The Minority Government of the Conservative Party - also still internally divided in this matter - relies on the votes of 10 DUP MPs when they need to get a majority in the parliament. In the face of such a decision, the possible adoption of a contract in the House of Commons would require convincing the party to change its opinion on the agreement or to obtain broad support from the eurosceptic MPs of the opposition Labor Party, who so far only single-handedly eluded their party line. In line with the conclusions of the last week's European Council, the British government has until Friday, 29 March, to accept the proposed agreement with the EU and leave the Community under its conditions on the new date of 22 May. Commentators have speculated in the last days that May will probably insist on submitting the draft agreement for another, third vote on Thursday or Friday, maximizing the pressure on the previous critics of this solution from the Eurosceptic wing of the Conservative Party and DUP. The contract was twice rejected by a large majority of votes: 230 in January and 149 in March. Earlier on Wednesday May declared that she was ready to leave her position earlier than she planned to "lead to what is right for our country and the party", opening the way to resignation if the MPs backed the brexit deal. During her speech, May called on MEPs to "endorse this agreement so that we would fulfill their historic obligation to implement the British decision and leave the European Union in a gentle and orderly manner." Her announcement made some of the previous critics from the Conservative Party change their mind and unexpectedly supported the draft agreement. Among them were, among others leading critics of the head of government, eccentric millionaire Jacob Rees-Mogg and former head of the Ministry of Foreign Affairs Boris Johnson. This change may turn out to be insufficient in the absence of support from the DUP. If the proposed agreement is not adopted by the end of the week, the United Kingdom will have until 12 April to decide either on brexit without a contract or to extend its membership in the EU and find a way out of political stalemate, for example by a second referendum or change of the proposed model of relationship from the EU (eg by remaining in the common market or in the customs union). On Wednesday evening MPs sitting in the House of Commons will vote on a series of alternative proposals to resolve the political crisis around the exit of Great Britain from the European Union. The opinion of the parliament will not be legally binding, but will constitute a certain political instruction for the government. I'm just wondering if european parliament's bots will treat and report usually to youtube words like social justice warriors will be treated as copyright infringement for instance enemies from Doom series known as demons(named mortally challenged because demons word is offensive)(since 1993) not monsters like in Undertale and Deltarune Chapter 1.Because bots have no feelings(Blade Runner it's an exception that biological androids might have human-like feelings)these A.I. algorithms are like digital personalities of Robocop(in his case being obedient to corporations as cyborg police officer) and Judge Dredd(1996)(his helmet reminds me of Captain Falcon from F-ZERO series)not 2014 remake were really edgy guys and blindly following the orders and rules of some sort of cyberpunk-like futuristic lawmakers. Last edited by luke11685; Apr 5, 2019 at 10:57 AM. Article 13. "ACTA 2": can filtering be avoided? The directive on the digital single market, which internet users baptized "ACTA 2", arouses emotions in our country. Most talk about articles 11 and 13, the records of which cause the greatest controversy. We wrote about article 11 earlier (INCLUDING THIS PLACE), now it's time for 13, which - in the scale of the whole of Europe - has become much more media. 'Member States shall provide that the provider of online content sharing services shall make public communication or public disclosure activities for the purposes of this Directive where it grants public access to copyrighted works or other protected subject matter posted by its users. The provider of online content sharing services must therefore obtain permission from the entitled entities referred to in art. 3 par. 1 and 2 of Directive 2001/29 / EC, for example by concluding a license agreement, for the purpose of making available or making publicly available works or other protected objects, 'reads the first paragraph of Article 13 (in an official document 17) of the Single Market Directive a digital device called "ACTA 2". It is of key importance for the subsequent entries that can be found in the article. It assumes that the "provider of online content sharing services", meaning - translating into a more understandable language - a website that allows users to publish content on their platform - must obtain a license for materials that appear in the online space created by him. At this moment, as in the case of Article 11, it is difficult to say exactly what this law will look like in practice. As we mentioned earlier, a lot depends on the national implementation of the Member States. It can be assumed, however, that the assumption of Article 13 is to prevent situations where users of social media publish content created by creators (musicians, graphic artists, photographers, etc. ), and these do not receive any financial gratification. So creators expect that Facebook, YouTube or Twitter giants will make agreements with them, based on which their works will be able to be freely distributed on social media platforms. (c) act promptly upon receipt of a duly substantiated objection from rightholders to block access to works or other protected subject matter to which the reservation applies, or to remove them from their websites, and make every effort to prevent their subsequent posting in accordance with . b) ". The above records, according to experts, constitute a significant threat. In their opinion, compliance with them will not be possible without first applying filters that will scan the content provided by social media users. On this basis, the algorithm, which will probably be based on the previously created database of works reserved by copyright, will decide what may appear on the platform without exposing it to the consequences of the creators. And although the directive clearly states that "the application of this article does not have the effect of a general oversight obligation (read filters - editorial note)", the people who create the online reality can not imagine how to select millions, if not billions of transmitted content, not using algorithm-based filters. In their opinion, it is technically impossible and unfeasible. Article 13 of the Digital Single Market Directive triggered gigantic protests in Germany. For at least a month there were street demonstrations in the country. Their participants pointed out that Article 13 could lead to preventive censorship. They also pointed out that filters based on the algorithm will not be able to catch exceptions in the directive, such as parody or pastiche (ie, memes, gifs or short videos), and therefore they will block anything that arouses even a shadow of suspicion about possible copyright infringement. Numerous protests led to the fact that the authorities of the German CDU party proposed - as it was defined - a "compromise proposal". It assumes giving up filters and negotiating between social networking sites and creator organizations. The CDU believes that platforms should agree to pay authors a fixed lump sum, and in return they will issue a license for unrestricted use of their works by website users. The proposal appeared before the final vote in the European Parliament on the directive and caused a lot of controversy behind our western border. The critics of this solution indicate that it is not feasible, because in the situation cited by the CDU, agreements should be concluded with ALL creators in the world. The legal-copyright organizations bring together only a small part of them, and today, the creator can really be anyone. What if someone is omitted and his work will still be on the social network? Then the case can find its end in court, which will lead to subsequent cases of this type. Large social networks can not afford it. The German budget commissioner Gunther Oettigner is also gaining a hint of the fact that the German idea is impossible to implement. The politician, immediately after the EP passed the EU directive, addressed the Member States. He appealed for - in a colloquial way - "do not slip" when introducing regulations. He also addressed the German authorities directly. "I do not want to sound like a teacher, but the directive sets out binding requirements and I expect the German government to fulfill them," said the European commissioner quoted by "Politico", who added that the European Commission would not accept "dilute provisions". At the same time, he admitted that in the future platforms may be forced to use filters to distinguish legal and illegal content. He thus made it clear that, although all supporters of the directive cite a provision that excludes the obligation of "general supervision", in reality this is how the application of Article 13 should look in practice. At this point it is worth recalling that Oettinger is the godfather of the voted directive. It was he who proposed it in 2016, at that time he was the EU commissioner for digital affairs. As for the alleged absence of filters, the words of the founder of the directive, German MEP Axel Voss, can also be reminded that he "can not guarantee" that the entities to which Article 13 will apply will not filter content on their platforms. "We do not provide mandatory transfer filters. We want platforms to license, buy rights to songs and obtain permission to use. I can not guarantee, however, that the measures taken by platforms to fulfill their responsibilities will work one hundred percent and therefore freedom of speech can sometimes be limited. But of course, nothing should be blocked, which is legal, "he said in an interview for German media. More HERE. In addition to the great websites such as YouTube or Facebook, the article 13 also touches ordinary web portals, which provide the opportunity to comment directly on their websites (doing so, for example, SejmLog.pl). In this case, in order to avoid - as we have determined to bypass them - it seems impossible - installation of expensive and probably defective filters services will be forced to turn off comments. At any time, material covered by copyright may appear in them, for publishing which the license portal does not have. In case it was not removed in time, the website owner would have to answer for allowing it to be published. The easiest way will be to simply turn off the possibility of commenting and - straightforwardly - have "clean sands". This situation will clearly limit the possibility of publishing your opinions. The natural debts will also die discussions and exchange of views, which most often took place in the comments under the text. The threats posed by article 13 are mentioned by Michael Bialek, the owner of the Wykop.pl website (he is also subject to article 13, as the one that allows the publication of content to its users), in an interview with the money.pl portal. "ACTA2 is supposed to protect copyrights, but that can mean censorship. Even a blogger will have a serious problem. Not to mention large websites, such as, for example, Wykop. If only protected content appears in the comments under the texts, this may mean that the owners' rights have been infringed, "he says. "Around 100,000 appear on Wykopie comments a day. We do not have the technical ability to check all of them in terms of citing content protected by copyright. Even the supporters of this new law admit that they do not know such a mechanism that would automatically verify these possible violations, "he adds. Bialek draws attention to the abandonment of comments mentioned by us. In his opinion, this will withdraw the Internet to the times when Facebook was not yet available, and interaction in the network did not exist. "Comments repeatedly add value to the content of the author, often entering into polemics with him, often indicating a different view on a given topic. Removing comments causes that the Internet will return to the times before Facebook or Wykop, where communication was only one-sided. We will go back more than a dozen years, "he says. "The censorship, which everyone is talking about, will consist in the fact that the opportunity to speak to Internet users will be taken away. The only voice will be the voice of the publisher, who usually advocates a party in a political or economic dispute, "he continues. All conversation with Bialek - HERE. The proponents of the new law are of another opinion. In their opinion, it does not pose a threat to censorship, they also claim that its consequences will not be felt by ordinary Internet users. Theodore Zwiefka, PO MEP who worked on the creation of the directive and for several years warmly pleaded for its adoption, after his vote he was happy. "Why am I personally pleased that this directive was adopted by the EP after many years of hard work? (...) Finally, we have a document on the table and the fairytale will end, the story of fairy tales will end, liar will end. Today it will be ordinary "check", if indeed one of the Internet users has deteriorated, there has been some harm, because this directive was accepted. Is there really provisions in this directive that do not allow for small and medium-sized entrepreneurs, start-ups that kill the freedom of speech on the internet, which do not allow the use of encyclopedic resources that are available on the Internet "- he said. In an interview with Radio Szczecin, Theodore Zwiefka also assured that filtering the content that the opponents of the directive are talking about will not. "Theodore Zwiefka, a MP of the Civic Platform, argues meanwhile that" filtering "will not be - instead, the internet giants will eventually have to share some of the profits with creators, including artists, scientists and writers," we read on the website of the radio station. Zwiefka has also repeatedly reminded that the directive introduced an exception, which assumes that the new law will not cover platforms that: operate less than 3 years, have a turnover lower than 10 million, and the number of users does not exceed 5 million per month. Critics point out, however, that in fact few websites are able to meet all of these requirements, so in reality the record will be almost dead. The MEP also reminds that according to the directive, the services will be forced to create an appeal mechanism in case of incorrect blocking of someone's content. Here, however, his party colleague Michael Boni does not agree with him, who in an interview with Internet users on Wykop.pl gave an example of a blocked comment. Before we go through the entire appeal procedure and someone will check whether - let's say - we used the pictures in the form of a quote, our answer may not have the slightest sense. "Internet is a moment" - argued the MEP. At this moment, as in the case of Article 11, it is difficult to say what will be the article 13 on the basis of Polish law. Representatives of the Ministry of Culture, which will deal with the implementation of the directive into our legal order, admit that they will try to implement the provisions in such a way that nobody will be harmed. The analysis of available sources and expert statements indicates, however, that the departure from the issue of common filtering, although the directive excludes it theoretically, can be extremely difficult. The whole text of the directive - HERE. So will this thread https://www.jazz2online.com/jcf/showthread.php?t=2394 might violate DMCA?You know guys copyrights infringement stuff. Do administrators and moderators will be forced to create bots on this very forum or else we will suffer the consequences?I guess usually money penalties,right? I found today's(here it is)Poll: 35 percent The British want brexit delay, 41 percent. - exit without a contract.Does it mean they don't want Brexit anymore?Does it mean England wants support of European Union and re-join to European Union membership?I guess they are expecting re-election of prime minister Theresa May this means second David Cameron(it could be something similar I'm not sure just speculating like in Germany chancellor Angela Merkel had won her second election) election or maybe another democratic candidate for new UK prime minister. A quarter of Britons would boycott the elections to the European Parliament, if they take place in the United Kingdom in May, after the brexit has been translated - according to the Sky Data survey. Just over a quarter of respondents (26 percent) announced that they would boycott possible elections to the European Parliament if they had to go to the UK. 47 percent of the respondents confirmed their participation in the election, and 17 percent admitted that regardless of the date of brexit, they would not vote anyway. The actual turnout in the last European parliamentary elections in the United Kingdom amounted to 36 percent in 2014. Usually, however, more people declare that they will go to the polls than actually do. However, as many as 43 percent of the respondents assessed that they would be dissatisfied if the elections were held (30 percent chose the answer "very dissatisfied." 28 percent of the respondents expressed their satisfaction with the next vote, 23 percent "do not mind." In the survey, more people expressed their support for non-contractual brexit than for the continued prolongation of UK presence in the EU. The respondents were asked what option they would choose from: leave the Community without agreement, leave brexit related to the next elections to the European Parliament and accept the agreement negotiated by Theresa May in Brussels. The poll definitely declined the prime minister - her contract was supported by only 16 percent of the respondents. 35 percent chose to delay brexit, but hard brexit was the most popular - this option was chosen by 41 percent of respondents. Theresa May asked in a letter to Donald Tusk to delay brexit until June 30, 2019, to give MEPs time to agree on the withdrawal agreement. Tusk, however, proposes to postpone the divorce of the United Kingdom to the Community by March 31, 2020. Sky Data is a survey with a nationally representative sample of 1 295 Sky TV clients to whom SMS messages were sent. The study was conducted on April 5, 2019. I'm afraid someday memes about him will be strictly forbidden and blocked on youtube or rather just removed https://www.youtube.com/watch?v=TbHvRyrDPl4 in future. Warning this article might be insulting to some users here,harassing someone or even might be quite offensive to the others it contains strong language(adult swim),mature sense of humor I guess in future bots will block such a articles in the future http://uncyclopedia.wikia.com/wiki/P...al_correctness and antisemitic satire http://uncyclopedia.wikia.com/wiki/Jew that's the whole point of Article 11 and 13,right? I'm afraid in future meme gags for instance YouTube Poops will disappear forever(nothing changed for now) https://www.youtube.com/watch?v=4bM2b5cfeZo however in forum related only to Doom they are making new website about that forum in polish uncyclopedia they will also make new website probably open source in the future. https://www.youtube.com/watch?v=Nc6IwbglU88 that Gentlemen anagram was sounding funny,don't you think? Last edited by luke11685; Apr 13, 2019 at 01:28 PM. The copyright directive has been accepted. Poland and five other states against. The European Union countries adopted a controversial copyright directive on Monday. In the vote, most countries supported the project. Poland together with five other countries was against. According to unofficial PAP information, the following were against the directive on Monday: Poland, Luxembourg, the Netherlands, Italy, Sweden and Finland. However, this was not enough to block the entry into force of the regulation. The following countries abstained: Belgium, Estonia and Slovenia. In February in Brussels, representatives of the EU countries agreed on the controversial rules on copyright. Eight countries, including Poland and Italy, opposed the proposed legislation. However, this was not enough to block the entry into force of the new law. It was only one of the stages of the legislative process. In the next stage, a few days later, representatives of EU countries, the European Parliament and the European Commission concluded a compromise regarding the final shape of new regulations. This compromise in March supported the EP at the plenary session. However, the compromise had to finally be approved by member countries, which happened on Monday. ACTA 2 voted. EU countries have adopted a controversial directive. The controversial EU copyright law - colloquially referred to as ACTA 2 - was adopted by the countries of the European Union. In the final vote, most of the Member States supported the project. Poland and five other countries were against. In the next stage, a few days later in February, representatives of EU countries, the European Parliament and the European Commission concluded a compromise on the final shape of new regulations. This compromise in March supported the EP at the plenary session. Articles 11 and 13 are the most controversial in the Directive. Article 13 introduces the obligation to filter content from the point of view of copyright, while Article 11 deals with the so-called related rights for press publishers. The first one is most often referred to in the context of threats to freedom of expression on the Internet. Pursuant to the provisions of art. 13 will not be covered: online encyclopaedias, eg Wikipedia, educational and scientific archives and passive platforms (so-called cloud services for individual users like Dropbox), open access platforms, sales platforms like Ebay or Amazon and all platforms, whose main the purpose is not to access or store copyrighted content (e.g., dating portals). Platforms covered by art. 13, should sign licenses with the owners of rights on content protected by copyright. If the platform does not receive such a license, it will have to delete the content indicated by the rights owner. If the platform does not fulfill its obligations, it will be responsible for illegal content entered by users. Regulations, however, are not intended to cover the work of Internet users such as memes, gifs, etc. Art. 11., referred to by opponents as a tax on links, refers to what elements of a journalistic article may be published by aggregators of content without the need to pay license fees. Regulations require that platforms, such as Facebook, pay copyright holders for content published by users or delete such materials. Press publishers will be able to negotiate licenses with platforms and aggregators of content. The new law does not apply to the private and non-commercial use of press texts by individual users, nor does it apply to hyperlinks, and with them a short excerpt from the article. By virtue of the regulations, publishers are obliged to share the proceeds from the new law with the authors of a given publication. Last week, on Thursday at a meeting of EU ambassadors in Brussels, Poland expressed opposition to the proposal to adopt a directive on copyright. According to unofficial information, Poland's position was then supported by the Netherlands, Finland, Italy and Luxembourg. Poland emphasized - as reported by the EU diplomat - that although the purpose of the new regulations was to strengthen the functioning of the common market, stimulate innovation, creativity, investment and creating new content in the digital environment, the directive in its adopted form will not achieve this goal properly. The representative of Polish diplomacy also pointed to the meeting - as the source said - that the directive in the adopted form does not ensure a proper balance between the owners of copyright and the interests of EU citizens and companies. The EU Council approved a new copyright law together with Article 13 (17). The Council of the European Union adopted a new directive on copyright, colloquially referred to as ACTA 2.0, together with the controversial Article 17 (earlier 13) and Article 15 (earlier 11). The Directive was supported by the majority of voters. Poland voted against. There is no doubt that a change of copyright in the EU is needed. The current regulations are not ready for digital distribution, the internet, the ability to independently publish a huge number of their works and ubiquitous linking of digital materials. Work on the new directive has been ongoing since 2016 and initially did not arouse much interest. However, recent months have been marked by lobbying for changes and protests against two controversial provisions - a tax on linking and filtering platforms. On March 26, the European Parliament rejected the changes in the controversial record (317 to 312 votes) by a small majority. The directive was adopted by a majority of 348 votes with 274 votes against. The last stage was the vote of the European Council, which took place on the morning of 15 April 2019. For the directive to be adopted, a majority representing 65% was required. population of member countries. The result of the vote was 71.26%. Undoubtedly, the representatives of the majority of EU residents are in favor of the new copyright in the current form, i.e. with the controversial articles 15 and 17. Poland voted against the directive, as well as Finland, the Netherlands, Luxembourg, Sweden and Italy. Belgium, Estonia and Slovenia abstained from voting. Germany and the United Kingdom turned out to be the greatest supporters of changing the copyright law. History loves repeating itself https://www.youtube.com/watch?v=xltO0Xcdm1s same thing happened here 6 years ago https://www.spiegel.de/international...-a-929871.html president of United States condemned the law in Europe he could violate GDPR. Last edited by luke11685; Apr 16, 2019 at 09:57 AM.